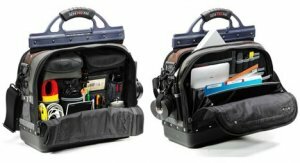 It was a couple of years ago when I first wrote about the Veto Laptop bag, but somewhere down the road the bag was discontinued. Now Veto is back with two new versions of the laptop bag, and it looks like they made a few changes. From the outside, the bags look nearly identical to the regular Veto bags with slight changes to the handle and a now non-hook&loop shoulder strap that now uses a clip to stay in place. The Model LT bag is the smaller of the two and is pure laptop bag with no room for hand tools. One side of the bag features four large neoprene pockets, two horizontal magnetic flap pockets, two PDA/Phone pockets, a few pen pockets and more. The reverse side contains a large padded slot that safely places the laptop (up to 17") in the middle of the bag, while a second outer compartment features six smaller neoprene pockets, two mesh tablet pockets, and three file folder pockets. In total, the LT has 34 pockets. The larger Model XLT is very similar to the LT bag. The first side of the bag is the same as the first side on the LT, with the four large neoprene pockets, two horizontal pockets, etc, but this time, the padded laptop slot is also on this side. The reverse side now features many large neoprene pockets and a mixture of smaller pockets that can all be used to house hand tools. To accommodate the tools, the XLT is a couple of inches wider than the LT. The XLT offers a total of 47 pockets. Both models are coming soon, so keep an eye out for pricing and availability.